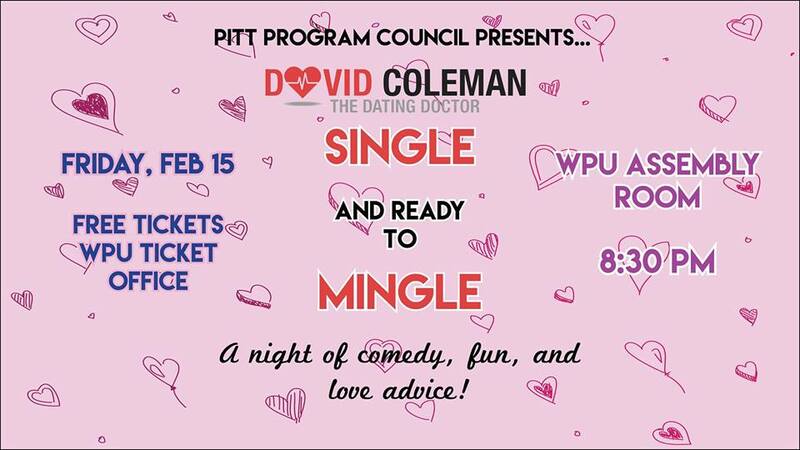 Join Pitt Program Council and David Coleman, the “Dating Doctor,” for a night of advice, humor, and fun! Reporting “on-line” to be “in a relationship” is a far cry from actually being in one as the speed of dating and relating has accelerated dramatically. Apps like Tindr, LuLu and Grindr and sites like Instagram, Twitter, Facebook, OK Cupid and Plenty of Fish have forever changed dating’s landscape. One post, one text, even one picture can alter multiple lives in a moment and be used to inflict intentional or unintentional harm on others. In a humorous, yet challenging way, 14-Time National Speaker of the Year, David Coleman, The Dating Doctor, will help you navigate dating’s treacherous landscape as he addresses: mutual consent, safe words, becoming an intervene r, The ABC’s of Initial Interest, flirting versus sincere interest, the characteristics of healthy relationships, subtle signs that cheating may be taking place, surviving and thriving following a difficult (public) breakup, 7 traits we look for in others, common mistakes made during on -line dating, long-distance relationships, military relationships and more. Tickets are free in the WPU Ticket Office starting on January 28th! Pick up a ticket for you and that friend who desperately needs relationship advice!